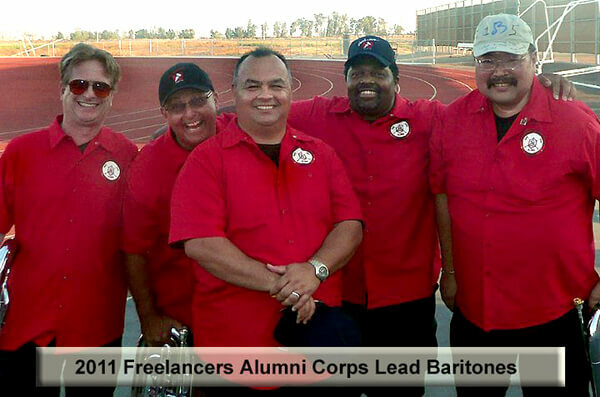 This is the lead baritone section of the Freelancers Alumni Corps and guests. ?The picture was taken at the SoCal Classic Drum & Bugle Corps Show in Ontario, Calif. hosted by Impulse Drum & Bugle Corps on July 16, 2011.? Only "The" Carl Allison (2nd from the right) marched and aged out with the Capitol Freelancers from 1977 - 1983 and served as drum major in 1982 and 1983. The other corps alumni represented are West Coast Express, Valley Fever, Santa Clara Vanguard, Scarlet Lancers and Continental Ambassadors from Wichita Kan., the "original" Velvet Knights, and the Blue Devils.? The four gentlemen on the left met one another when they were lead baritones with the Anaheim Kingsmen Alumni Corps that performed at the DCI Semifinals in Pasadena, Calif. in 2007.? You're never too old to make new friends in drum corps.